Kuwait, 05 June 2017: The Promenade mall, the neighborhood destination in the heart of Kuwait, has teamed up with Faisal Clinic, local doctors, dieticians and fitness professionals to encourage the people of Kuwait to stay active and healthy during Ramadan with a fun fitness program. With an objective of bringing together the entire spectrum of Kuwait’s society to workout under one roof and enhance community spirit during the Holy Month, the ‘Get Fit Ramadan’ program is designed to take place at the mall, Sundays through Wednesdays, until June 14. The pre-iftar one-hour session from 5-6pm targets all members of the family and community with 5 different training programs tailored for different age groups and genders, whether guests want to enjoy a light walk or a higher intensity workout. There is also a special children’s exercise zone for children aged 5 to 13 with lots of fun packed activities while women can enjoy their workout in private in the 2nd floor of the mall that’s completely dedicated for females. Instructors from The Promenade’s Wiggles along with other local personal trainers, are hosting the fitness sessions and offering training advice and tips on how to stay active and healthy during Ramadan. Dieticians are also on hand, giving tips on the best food to eat to break your fast after exercise, and the right nutrition to fuel yourself after a Ramadan workout. Medical professionals from the Fawzia Sultan Rehabilitation Institute are on site offering free health advice. “Supporting the community and giving back to society is at the core of what we strive to achieve and this initiative is just one of our many commitments to our corporate social responsibility,” said Noor Al-Sadoun, of The Promenade. “We felt this was a great way to bring everyone together and show people how they can stay active at this special time of year.” She added. 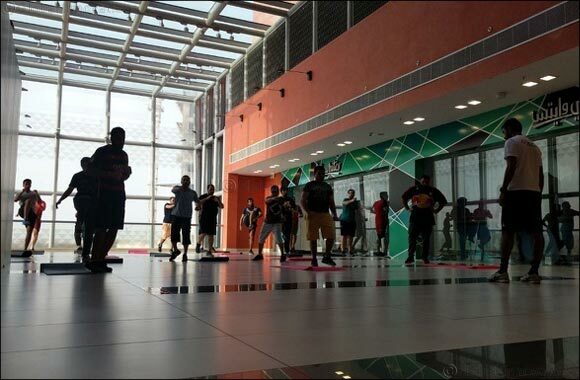 The ‘Get Fit Ramadan’ program, which runs until Wednesday, June 14, incorporates fun weekly competitions on Thursdays, during which participants can pick up prizes for their efforts from stores in The Promenade and other local businesses.